It will be important to have a couple of baking sheets for this recipe. Heat the oven to 400 degrees. Mix the red and sweet potatoes, garlic and onion in a large bowl. Drizzle the olive oil over the potatoes, garlic and onion and mix either with your hands or a spoon until all pieces are coated. (Use a little more olive oil, if necessary). Spread the potato mixture on a baking sheet (use a coated sheet or spray with a non-stick spray). Sprinkle the seasonings over the potato mixture and place the baking sheet (use more than one if necessary to achieve a single layer) in the oven. Roast the potatoes for about 20 minutes, take them out and turn them, then put them back in the oven for another 30 minutes. Once the potatoes are golden brown, take them out of the oven and place them in a serving bowl. Serve immediately. 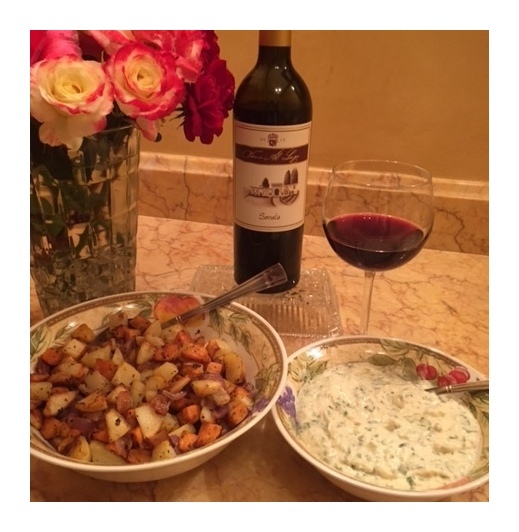 We like to serve these potatoes with our recipe for the Horseradish and Green Onion Sauce.